The indoor rock climbing center features a 32′ high climbing wall and a 45′ long x 12′ high bouldering wall. UMaine Students and Campus Recreation Members climb FREE with valid MaineCard or RecCard. 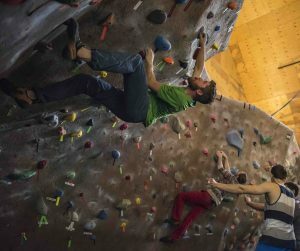 Entitles pass holder to climb during open recreation times at the climbing tower and bouldering wall located at the Maine Bound Adventure Center. No other membership benefits or discounts are given with this pass. Fee is prorated by number of days remaining in the semester. This is an individual pass, family members cannot be added. Please visit the Campus Recreation website for family membership information. Grants entry only to the Maine Bound Adventure Center, valid only on the date purchased. Must be purchased at the New Balance Recreation Center. Grants entry to the New Balance Recreation Center and the Maine Bound Adventure Center, valid only on the date purchased. Risk Release (AKA Liability Waiver) Required: Before your visit, please review and complete the General Use Liability Form, and bring it with you. The form can be found here. Please note that anyone under the age of 18 must have their liability form signed by either a parent or court-appointed guardian unless they are enrolled at UMaine. 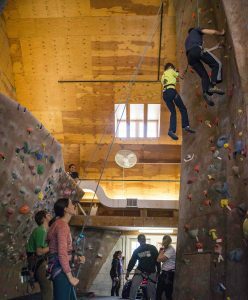 Interested in hosting a birthday party, or just bringing a group to the Maine Bound Adventure Center for a couple hours of climbing? We provide friendly, experienced staff to teach and belay for your event. You will have access to the climbing tower and bouldering wall for 2 hours. In addition, if you contract with us outside of our climbing wall’s normal hours of operation, you will have the entire facility to yourself! Fee is $12 per person per 2 hours; equipment and Instruction are included. Click here to make a group reservation! Do you and your family love to climb but have little to no experience? Then sign up for an informative two hours with our friendly staff. You will learn the intricacies of our facility, the different types of climbing we offer, and some basic climbing techniques. This is a great event for parents and children looking for a fun family activity! Join us every Thursday from 3:00-10:00 p.m. and climb for only $3 each!!! Bring your friends and family, including kids! This is a great opportunity to mingle with the climbing members of our local community and have a blast! Maine Bound climbing gym is open for route setting from 6:00-9:00 p.m on the 1st and 3rd Tuesday of each month during the Academic Year. From the seasoned setter to the beginner, all are welcome. We also host route setting clinics on these evenings, so if you haven’t set routes before, please come in to learn the basics. The University of Maine in partnership with the Adaptive Outdoor Education Center’s Horizons Alpine Climbing Program is now offering adaptive climbing. The program is designed to provide assistance and accommodations for individuals with cognitive or physical differences, no experience necessary! The program will include weekly adaptive climbing sessions on Wednesdays from 4:30 – 7:00 p.m. during the Academic Year, as well as additional events throughout the semester. Participation in the weekly climbing sessions is free for volunteers, Campus Recreation members, and Students; Non-Members pay just $5. Sign up to volunteer! Fill out the Google Form to apply. Event pre-registration is required; visit the Adaptive Outdoor Education Center website. To sign up to be a volunteer please fill out this Google form. 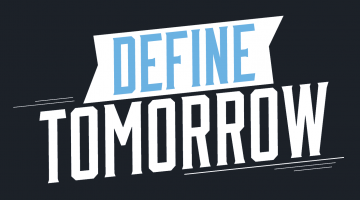 For more information, email Chris Bartram, Maine Bound Coordinator, at christopher.bartram@maine.edu.